Sweet, warm, and spicy, Glögg (sounds like "glue-gh") is Sweden's seasonal mulled wine gift to chilly souls around the globe. Often enjoyed as a Christmas holiday drink, Glögg carries the classic connotations and merry musings of its Old Norse origins, meaning "glowing ember." This feisty and festive mulled wine recipe welcomes winter with intense allspice aromas and warm palate pleasing pep. While many European countries have their own tasty versions of mulled wine, the Swedish take on this delicious drink tends to turn things up a notch with a splash of bourbon or vodka and the added aromatics of cardamon pods. Keeping with many of the belly-warming spice themes found in Germany's Glühwein, Swedish Glögg traditionally strains out the spices prior to serving and adds a dash of blanched, slivered almonds and raisins to the final mug. This easy-to-make, even easier to drink, traditional Glögg recipe is based on a bottle of red wine, the rich warmth of cinnamon, cloves and cardamon spice and a touch of sweet. Not limited to yuletide happenings, Glögg is picture perfect for holiday parties, festive winter gatherings, or as a quick warm up on snowy days. Promising good cheer in a steamy cup, Glögg charms with high-octane aromas, super spice and the warm glow of good wine. Combine the wine, optional bourbon or vodka, sugar, orange peel, raisins, cardamom pods, a slice of ginger root, cinnamon stick, and cloves into a 2 to 3-quart pot. Heat to 175 F (77 C) and let simmer for 2 minutes. Gently reheat and add 1 teaspoon of blanched, slivered almonds and 1 teaspoon of raisins before serving. Feel free to garnish with a slice of orange on the side. This Glögg recipe is easy to make and strain ahead of time and keep in the refrigerator for a quick warm-up and serve. May be served well-chilled, over ice in summer for a Swedish-styled "sangria." 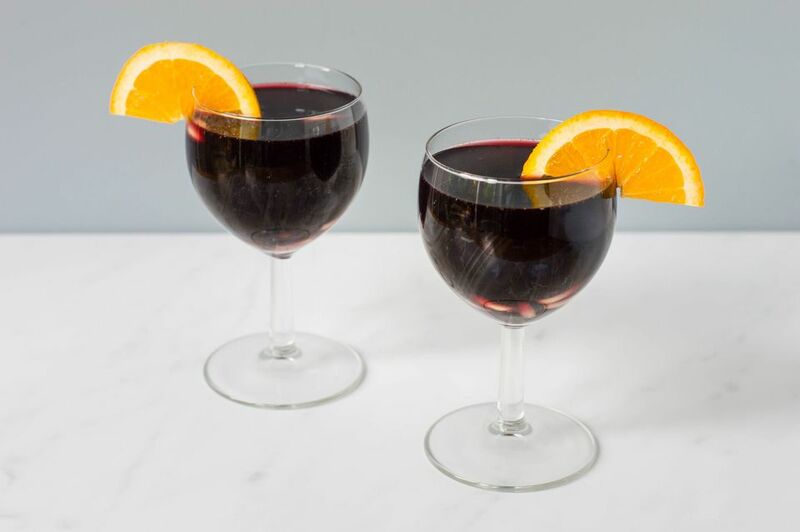 For a non-alcoholic version of this mulled wine recipe, replace the wine and optional bourbon with 2 cups of grape juice and 2 cups of apple juice.